In the beginning years the wine market festival in Oberwesel was held every 14 days and was a pure sales promotion of the numerous vine dressers of the town of the towers and of the wine. But throughout time the Oberweseler wine market developed itself more and more to a tourist attraction and today it counts to one of the hightlights of the vintage festival on the Rhine river. The Oberweseler vintage dressers and wine grape growers await a numerous amount of guests in their wine stands and booths on the market place. 6:00 p.m. Opening of the wine market. Begin of the wine bars at the wine well and in the wine stands and booths on the market. Subsequently live music and dance. 1:00 p.m. Opening of the wine market with cannon ball shooting. 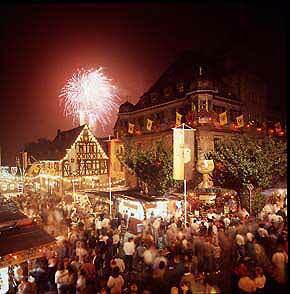 Begin of the wine bars at the wine well and in the stands and booths and promenade concerts on the market place. 3:00 p.m. big organ concert in the Liebfrauen church. From 7:00 p.m. live music. 5:00 to 7:30 p.m. possibility to embark the special boats. More than 50 special boats wait for the numerous guests to see the nightly firework display from the Rhine River. The musical brilliant firework display in front of the medieval backdrop of Oberwesel is the highlight of the boat parade. About 8:15 p.m. begin of the boat parade at the Lorelei Rock. Illumination of the Lorelei Rock. 9:20 p.m. Oberwesel illuminates its historic townscape. 10:10 p.m. The boat parade turns back to its starting point. On the wine market festival wine stands of the Oberweseler wine dressers, happy medley and dance music. 11:00 a.m. opening of the wine market with cannon ball shooting. Begin of the wine bar in the wine stands and booths on the market place. Up to 1:00 p.m. promenade concert of a brass band orchestra. from the train station to the north end of the town and back to the market place. 4: 30 p.m. the parade procession finds its end on the market place. The wine witch from Oberwesel and the representatives of the neighbouring towns welcome the guests. 5:00 p.m. On the stage at the market place live music. 11:00 a.m. Begin of the traditional morning pint with entertainment music. Wine bar in all wine stands and booths on the market place. 4:00 p.m. Opening of the wine market with cannon ball shooting. 8:30 p.m. live music on the market place. Entrance free on all wine market days.